When it comes to the real estate industry, a well-crafted landing page for your real estate website is a great way to showcase a popular property and encourage visitors to check it out and inquire about renting or buying. A great real estate landing page design will set you apart from your competition and allow you to promote your services which will help you sell more properties and book more house tours. Luckily, thanks to real estate landing page templates, you can easily create your own website. In this post, we’ve rounded up the best real estate landing page templates so you can create or redesign the website for your real estate agency. Envato Elements provides access to design assets such as landing page templates for a low monthly fee. 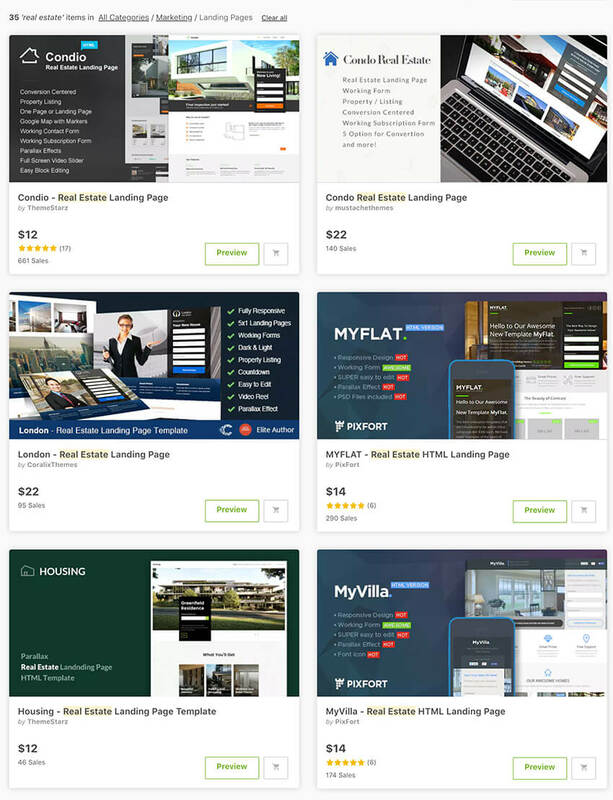 One of the places where you can find high-quality, premium, landing page templates for real estate websites is Envato Elements. Envato Elements is a popular marketplace full of design assets such as landing page templates made for realtors as well as assets such as icons, fonts, stock photos, and more. The pricing is very simple—for a low monthly fee, you get access to thousands of design assets that can be used in unlimited projects. Below, you’ll find five real estate landing page examples from Envato Elements. The templates are not only beautifully designed but they also come with all the necessary features for real-estate agencies such as the ability to filter through the properties, Google Maps integration, responsive design, and more. The MYFLAT real estate landing page template features a modern and clean design. The template features a prominent form right above the fold so visitors can immediately start searching for properties. The rest of the page allows you to highlight what makes your agency different as well as to showcase popular properties. The template is also fully responsive and can easily be edited. The Propper template features eight different landing page versions that you can change out easily depending on what you want to focus on the most in your business. If you’re just starting out, you can use the version that allows visitors to search for properties and if you’re already an established realtor and want to generate more leads, consider using the version that has an email sign up form. You can also choose between static or video backgrounds, which are sure to catch the attention of potential clients. On top of that, the template is fully responsive and includes helpful shortcodes so you can insert headings, accordions, tabs, and more. The Condio template features a one-page design, which is perfect when you don’t want to spend hours creating a website. It’s also easier for your visitors to immediately access all the important information. Condio comes with a minimal design, includes a property search form, and is fully responsive. You can also customize it to your liking and choose from five homepage versions, one of which includes a stylish parallax effect. The MyVilla template comes with an elegant and stylish design. The template is fully responsive, allows you to showcase testimonials from past clients, feature popular homes, and add a property search form to make it easy for visitors to find their perfect home. You can also customize the template to fit with your brand and set it up in minutes thanks to the extensive documentation. Envato Elements is a great choice for designers, freelancers, and anyone else who needs high-quality real estate landing page templates on a regular basis. As we’ve mentioned earlier, you can download unlimited templates and other creative assets such as presentation templates, stock photos, business cards, icons, and more. Sign up for Envato Elements, take advantage of the low monthly fee, and download as many landing page templates and graphics as you want, use them in unlimited projects, and customize them to fit your needs. 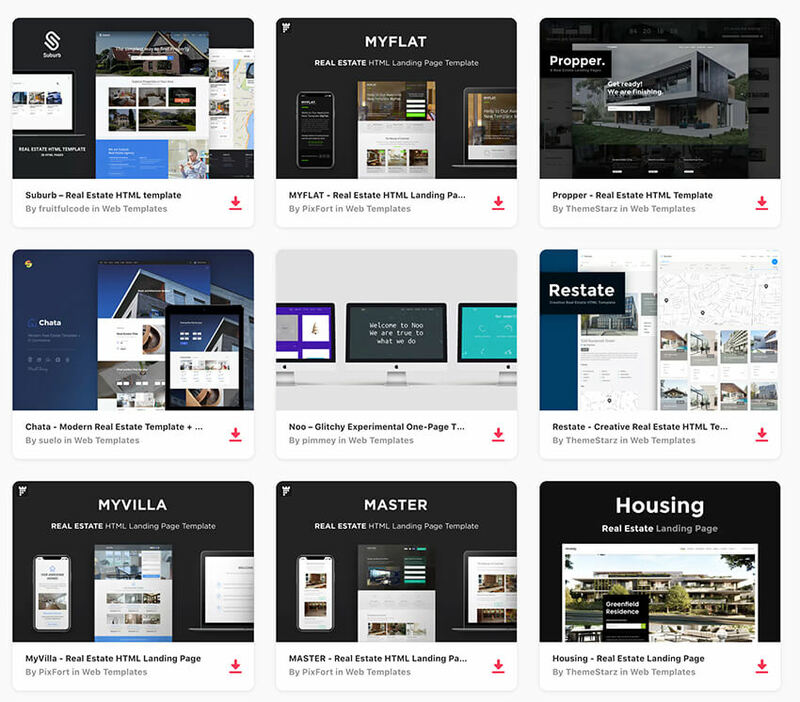 ThemeForest is another great source for landing page templates for real estate. You can find real estate landing page templates on ThemeForest, which is another creative marketplace. ThemeForest allows you to purchase templates as you need them with no ongoing fee. You pay per item you want, which makes ThemeForest a great choice for website and business owners who want to DIY their website. Here’s a selection of the best real estate landing page templates available on ThemeForest. The London template has a minimal design with plenty of white space and gorgeous typography that makes your featured property the center of attention. You’ll find plenty of space to add a working property search form, showcase other popular properties, testimonials, and more. The template is also fully responsive. The EstatePro template comes with a light and dark version as well as the ability to customize the design to fit your own brand. You’ll find a working inquiry form, prominent call-to-action buttons, client testimonial sections, social network icons, and more. This template is splendid! Every part of it is superb from the code to the design, documentation, feature availability, FLEXIBILITY – Awesome! The Agents template is a creative real estate landing page template that was built with conversion optimization in mind. The template allows you to insert several call-to-action buttons throughout the page and feature trust signals such as testimonials and client logos. It’s fully responsive and comes with three premade color schemes. You can embed videos and customize every part of the template to your liking. The Arpa template comes with more than 30 different demos that you can use for your real estate agency website. Easily allow visitors to search for properties, list amenities, and benefits of each property, highlight your real estate agents, and much more. Arpa is fully responsive, includes Google Maps integration, and a fully working contact form. If you’re looking for a stylish real estate landing page template, look no further than LeadPack. With more than 12 premade demos, 50+ reusable content blocks, and integrations with most popular email service providers, LeadPack has everything you need to create a powerful website for your real estate agency. The Lander real estate landing page is a perfect example of an easy-to-use template. This template is based on building blocks, which can easily be used and reused to create a landing page for your real estate business. Additionally, you can tweak any of the blocks and rest assured your site will look great even on mobile devices. The WOW template includes a powerful drag-and-drop page builder so you don’t have to worry about knowing any code. The template is fully responsive and comes with 14 premade demos so you don’t have to start from scratch. You’ll also find a working property search form, prominent call-to-action buttons, and a working MailChimp subscription form. The Select template is a perfect choice for beginners that want to get their real estate landing page up and running quickly. Thanks to a robust page builder and premade reusable sections, this template makes it easy to create your website. The template allows you to easily edit text, change colors, embed your videos from YouTube and Vimeo, customize images, and much more. Try the Your MultiTemplate option if you’re looking for an easy-to-use, yet flexible real estate landing page template. You’ll find a number of premade landing page designs as well as various header variations and parallax sections that’ll emphasize your calls-to-action. The template is fully responsive and easy to customize. Consider the Condo template if you want to convert as many visitors into new clients. This template features a prominent property search form, video integration, custom social media icons, and more. You’ll also find Google Maps integration, the ability to add a countdown timer, and sections to highlight your properties and real estate agents. 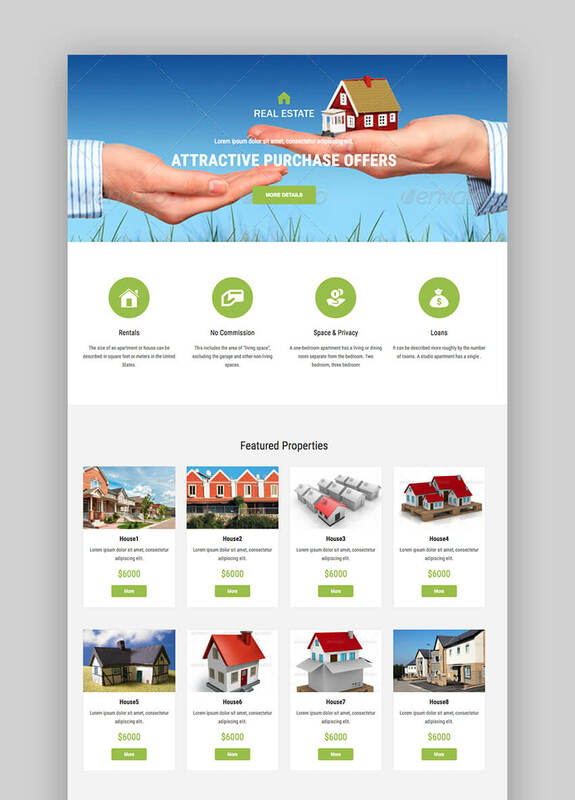 Try the Promo template if you want a simple real estate landing page template. Similar to other templates on this list, this one is fully responsive and comes with a beautiful property search form. You can choose between 10 different demos and customize colors, fonts, and every other part of the template. Once you choose your real estate landing page template, there are a few tips to keep in mind that’ll help you close more real estate deals. Make it easy to search for a property. Use a property search form above the fold so visitors can start searching for properties as soon as they land on your site. Feature indoor and outdoor photos of properties. Make sure your property listings show both the inside of a property and the outside area, as well as property surroundings since this can help garner more interest in a property. Make sure your site is responsive. Considering more and more people are using their smart phones and mobile devices to search online, choose a template that’s optimized for mobile devices. Build trust. Show potential customers that your agency and real estate agents are the best in the business by featuring testimonials from past clients. Include multiple CTAs. Your call-to-action (CTA) should be at the top of the page, but don’t forget to include several of them throughout the page to increase your conversion rate. Your CTA can be an invitation to search for properties or to schedule a complementary orientation call. Creating your own real estate landing page is a must if you want to sell more properties and land more clients. Start building your site today with one of our premium real estate landing page templates from Envato Elements.